Pocket Door Market size is estimated to surpass USD 10 billion by 2024; according to a new research report by Global Market Insights, Inc. Rapid growth in construction & renovation of the residential & commercial buildings is the key factor fueling pocket door market size. Increasing demand from infrastructure and real estate projects will drive the product demand. In 2017, according to National Association of Home Builders, the U.S. remodeling and home building investment accounts for 3% share of GDP. Increase in public, as well as private infrastructure expenditure is anticipated to propel the industry growth. Rising modular and stylish lifestyle owing to rising disposable income will provide strong business outlook for the manufactures, thus supporting industry expansion. In addition, shift in consumer preference towards premium quality products with aesthetic in their homes likely to fuel product sales. Technological advancement and innovations for conserving energy in buildings will positively enhance the industry growth. Stringent government norms to enhance the utilization of energy efficient products for reducing carbon emissions in Canada and UK fueling product sales. Increasing demand for automated entrances in the commercial and industrial sector will further propel the industry growth in coming years. 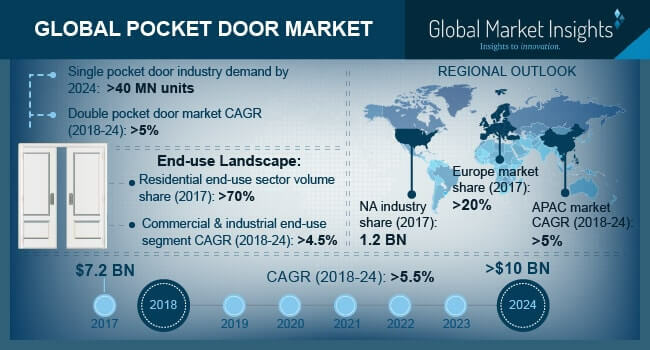 Single pocket door market is projected to witness CAGR over 5.5% in terms of revenue up to 2024, owing to its ease of installation, sound & thermal insulation, and modular appeal. A variety of materials such as glass, aluminum, steel, etc. can be used for the product development depending upon the purpose for which it is being installed. This level of diversity of features and its ease of operations likely to propel product adoption rate. Wood accounted for more than 45% of the industry share in 2017. Apart from the aesthetic appeal, wooden material tends to have a long life especially when good quality timber is used. Also, wood is not prone to rust, it does not crack or chip and is highly customizable to fit any opening size. These factors make wood an ideal option for product development in the long run thereby increasing the segment growth over the projected timeframe. Asia Pacific is anticipated to witness growth over 5% up to 2024. Countries such as China, Indonesia, Thailand, and Malaysia are expected to witness significant growth in population which will bolster the increase in average size of housing. This will indirectly impact the product sales in the residential sector and outpace its applications in the non-residential segment. European pocket door accounted for over 20% of the global revenue share in 2017. Increasing urbanization rate and rising demand for aesthetic customization will further boost industry growth in this region. Rising income level coupled with affordable housing schemes launched by the government will augment regional demand over the projected timeframe. Some of the key industry players in the market include Ferrero Legno, JAP, Allgood, Scrigno, Eclisse UK S.R.L, JB Kind, and Ghizzi & Benatti. Other notable players include Portman, LPD, Raydoor, Selo, Fleetwood, Slidesystems, Linvisible, Bertolotto Porte, Casali, FOA Porte etc. Manufacturers are anticipated to adopt mergers & acquisition strategy to gain competitive advantage. The company players practice integrations across various levels of the value chain to increase their presence in the industry. The manufacturing companies are entering strategic alliances with multinational home décor brands to further increase their profitability.